I live in the mid-western United States. We have hot summers and cold winters. I have an enclosed porch off the back of the house that I want to replace the flooring. We have removed an old outdoor carpet to reveal wood floor boards. The porch sits about three feet from the ground. It is not temperature controlled, it is enclosed, and serves primarily as a mudroom. What enclosed porch flooring options would work best? Would a vinyl tile hold up to temperature changes? As long as your wood boards are in good repair, meaning they are not rotted, have dry rot, or other issues, you probably would have no issue applying a new flooring on top of it. However, depending on the age and condition, you may want to replace it, especially if you are laying a new tile floor. At the least, if laying tile or other stone of some type, I'd put a new under lament of exterior plywood on top of it. As an added precaution, I would also lay plastic over the ground underneath the existing structure to help retard moisture. 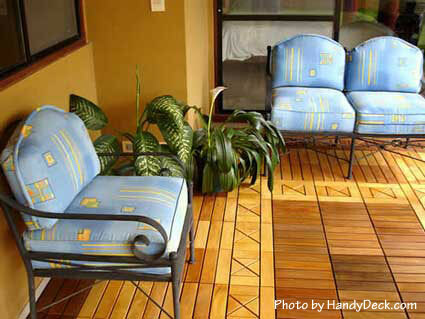 You may want to investigate interlocking deck tile options for your new floor. They come in a variety of colors, styles, and patterns, etc., and can be applied over almost any existing flooring. Even if your porch is elevated, you can still use other materials like stone or brick. 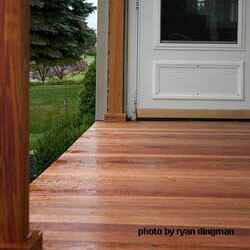 Consider using a wood to stone deck conversion system like Silca Systems. Learn more. Having made those suggestions, I would also encourage you to contact a reputable contractor in your area to look at your specific situation. Most will do so at no cost and they will be able to see things that I cannot which could substantially change what needs to be done.